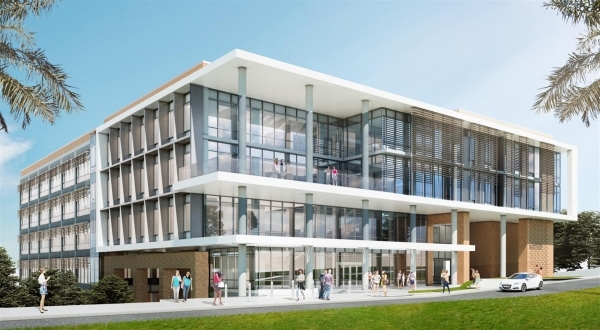 Do Business in the U.S.
A future five-story building designed to offer research and lab space to UC Riverside’s students and faculty is currently under construction. The official groundbreaking ceremony of the Multidisciplinary Research Building 1, known as MRB1, took place on Nov. 19. MRB1 will sit on 2.1 acres, located between Aberdeen Drive and North Campus Drive, north of the Materials Science & Engineering (MS&E) Building. MRB1 is a “serious investment in our research future,” Chancellor Kim A. Wilcox told the audience the morning of the groundbreaking ceremony. Its location is precisely in the middle of where students live and faculty do research, he said. “It’s a chance and an opportunity to bridge our two pieces, not with brick walls, but with glass and with open spaces, to emphasize this connection between our student life and our research life,” Wilcox said. This 125,000 square foot edifice is expected to be completed by fall of 2018, and will support up to 56 faculty investigators and their teams doing research on areas such as life sciences, chemical sciences, medicine, and engineering. MRB1’s design will reflect UCR’s roots, and will address its current needs, said Robert Gayle, UCR’s campus architect. Copyright © 2019 International Organization for Specialization. All Rights Reserved.